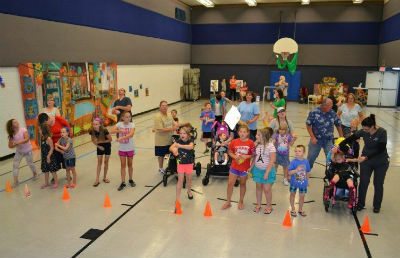 South Side Church of God in St. Louis, Missouri, held a fantastic Vacation Bible School late in the summer. This was their second year to host a Bible school that not only included children from their own church, but also families of children with special needs. Six children with special needs benefited from a one-on-one buddy. A total of twenty-two children were served. Our special needs children represented a range of challenges, from the very rare Kleefstra syndrome to deaf and blind children, non-verbal children, and children on the autism spectrum. The program was held at night so there would be plenty of adult volunteers, and so children with special needs could attend and not miss out on their therapies and visits to the doctor that are often in abundance during the day. The desire to have a Bible school that reached beyond the normal VBS comfort zone came from a family in the church with a child with special needs. The family has two daughters, and had been wanting to find a place where not only their children could participate, but where other families in the same situations could benefit. The first year, three children with special needs took advantage of the program. This year, that number doubled. The children and their siblings had a wonderful time and learned that God made us for a purpose. Parents loved that their children were treated like children first and, most importantly, perfect children of God. The siblings loved being able to attend with their brothers and sisters. Knowing that parents are reluctant to leave children that could have medical issues, we had nurses on staff and all teachers were trained how to handle issues from snack-time feeding to seizures. As a special treat to these parents, the church provided parents with $50 gift certificates to local restaurants so that Mom and Dad could have a date night while their children were enjoying VBS! The volunteers started out volunteering to encourage families and show the love of God to the children. However, they finished the week being blessed in ways they couldn’t even imagine. Dan, one of the volunteers, shared how he had been volunteering with the South Side’s children’s program for almost a year and one student, Ella, wouldn’t give him the time of day. By the end of Bible school, she adored him and wanted to hold his hand and sit near him. The VBS director said that the week was all about life change—not just for the families, but the church volunteers, also. God is continuing to move in the lives of all that attended, and everybody’s already excited about next year. Lydia Sergeant is a volunteer for the children’s ministry and director of VBS at South Side Church of God. Learn more about the Church of God at www.JesusIsTheSubject.org. This entry was posted in All Church of God, Central and tagged children's ministry, community, disability, families, family, handicap, kids, Lydia Sergeant, Missouri, MO, outreach, parents, Saint Louis, South Side Church of God, special needs, St. Louis, Vacation Bible School, VBS. Bookmark the permalink.